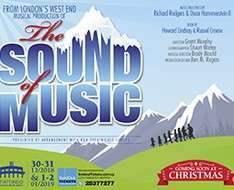 The classic musical «The Sound of Music», the oldest and mostly loved musical celebrates its 60 birthday in 2019 and will be staged in Cyprus at Christmas time . In 1959 the musical theatre was originally staged in Broadway and impressed the audiences! The music belongs to Richard Rodgers and the lyrics to Oscar Hammerstein ΙΙ based on the book of Η.Lindsay and R.Crouse. Featuring performers and a creative team from London’s West End, this classic musical comes for seven performances only. With the much-loved songs My Favourite Things, Edelweiss, Do-Re-Mi and Climb Every Mountain, The Sound of Music will be a treat for all the family. The production will be fully staged with beautiful costumes and scenery and accompanied by a live orchestra. “The Sound of Music” has enjoyed many productions in London, on Broadway and around the world. The 1965 film starring Julie Andrews and Christopher Plummer won five Oscars. Set on the eve of the Second World War, The Sound of Music tells the story of Maria von Trapp. Maria takes a job as governess to a large family while she decides whether to become a nun. She falls in love with the children, and eventually their widowed father, Captain von Trapp. He is ordered to accept a commission in the German navy, but he opposes the Nazis. He and Maria decide on a plan to flee Austria with the children. This production is directed by Grant Murphy with choreography by Stuart Winter and production design by Ben M Rogers. Brady Mould conducts the West End Theatre Orchestra. The production features a team of 50 from London.